Rocketing through gloomy skies with a payload clouded in a veil of secrecy, a United Launch Alliance Atlas 5 rocket fired away from Cape Canaveral on Tuesday to deploy a satellite thousands of miles above Earth. The 189-foot-tall booster, glistening in frost from tens of thousands of gallons of super-cold cryogenic propellant, lit its Russian-made RD-180 engine and lifted off at 8:10 p.m. EDT Tuesday (0010 GMT Wednesday). Riding a plume of rocket exhaust, the Atlas 5 rocket climbed through clouds left over from a series of evening thunderstorms that forced a two-hour, 26-minute weather delay. The fully-fueled rocket sat on the launch pad shielded by four lightning masts while the storms moved over Cape Canaveral and dissipated. The clouds finally thinned enough to permit liftoff at the end of Tuesday's launch window. The launcher's kerosene-burning RD-180 engine fired for more than four minutes, accelerating the Atlas 5 to the edge of space before switching off and falling away, leaving the rocket's Centaur upper stage to maneuver the mission's mysterious payload into an undisclosed orbit. The Centaur stage's Aerojet Rocketdyne RL10 engine finished the first of two burns about 18 minutes after liftoff, and ULA's live broadcast of the launch ended as the rocket began an unpowered coast through space lasting two-and-a-half hours. The hydrogen-fueled RL10 engine was supposed to ignite again for 70 seconds before deploying a satellite named CLIO at 11:02 p.m. EDT (0302 GMT). The last phase of the Atlas 5 launch apparently occurred as planned, and ULA declared the flight a success in a press release issued late Tuesday night. 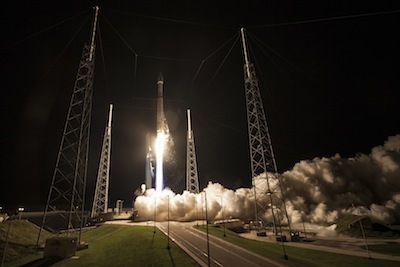 The level of secrecy is unusual for U.S. space launches. The National Reconnaissance Office, which owns the government's spy satellites, declares when one of its payloads is shot into orbit. "It is an honor to work with Lockheed Martin Space Systems Company and all of our mission partners to launch this very important satellite," said Jim Sponnick, ULA vice president of Atlas and Delta Programs, in a statement "Today's launch marks ULA's 11th successful mission this year and the 88th successful mission since ULA was formed in December 2006, a true testament to the teams focus on mission success, one launch at a time." Based on launch data released by ULA before Tuesday's mission, observers expected the Atlas 5 rocket to place the CLIO spacecraft into an egg-shaped transfer orbit thousands of miles in altitude. Such orbits are commonly used by satellites destined to operate in geosynchronous orbit 22,300 miles high, where a spacecraft's speed and the rate of Earth's rotation match up, allowing a satellite to remain over a fixed location on the planet. Jonathan McDowell, a scientist at the Harvard-Smithsonian Center for Astrophysics who expertly tracks global satellite and launch activity, said the Atlas 5's launch profile was likely targeting an orbit where the CLIO satellite could easily propel itself into a circular geosynchronous orbit with an on-board propulsion unit. Observers expected the Atlas 5 rocket to release CLIO in a geosynchronous transfer orbit with a low point, or perigee, farther from Earth than reached in a standard launch, making the satellite's route to its likely operating post shorter and saving the craft's precious propellant. CLIO's final orbit is still unknown. "If CLIO operates in a portion of GEO (geosynchronous orbit) within sight of my fellow hobbyists who track such objects, then they are likely to come across it eventually," said Ted Molczan, a respected Canadian amateur satellite tracker. The U.S. military and the National Reconnaissance Office own communications, missile detection and early warning, and eavesdropping satellites in such orbits. But the mission of CLIO is being kept secret. Lockheed Martin said the satellite is based on commercial technology, including the company's A2100 spacecraft bus, a type of platform used by commercial broadcasting craft, Defense Department communications satellites and the Air Force's Space-Based Infrared System for early warning of missile attacks. The satellite builder said there are more than 40 spacecraft currently in orbit using the A2100 satellite platform for commercial and U.S. government customers. 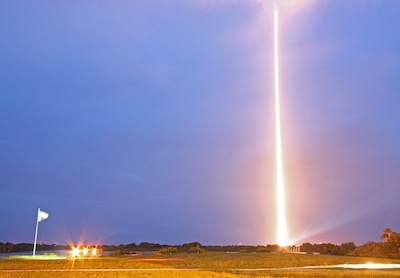 The paradigm of secrecy surrounding Tuesday's launch is similar to another satellite launch in September 2009, when a spacecraft named PAN lifted off from Cape Canaveral. Like CLIO, the PAN spacecraft was built by Lockheed Martin and launched on an Atlas 5 booster for an unspecified U.S. government customer.